On the new album Into The Deep, the seasoned instrumentalists of Galactic team up with a host of singers including Macy Gray and Mavis Staples. For 20 years, the New Orleans band Galactic has made people dance at clubs, festivals, house parties — you name it. "A first-rate funk band" is how The New York Times describes it. The group's half-dozen musicians hold their own without a regular vocalist. For their ninth album, Into the Deep, they invited several singers to guest star: big names like Mavis Staples and Macy Gray, old friends JJ Grey and David Shaw, and new discoveries like Jamaican-born singer Brushy One String (named for his one-stringed guitar). Saxophone player Ben Ellman says he and his bandmates enjoy tailoring their sound to different artists. "We're big fans of, like, The Meters and Booker T. & the MG's and these bands that have worked as sort of the backing band for various vocalists," he says. "And that has kind of been our model." It's a model Staples knows all too well. Her famous family, The Staple Singers, recorded with Booker T & the MG's. As a solo artist, she's been backed by several different rhythm sections over the years. When she agreed to deliver the song "Does It Really Make A Difference," it was like a dream come true for the musicians in Galactic. "Down to the moment when Ben and I were flying up to Chicago to record with her, we were like, 'I hope she shows up,' " bass player Robert Mercurio says. "And she was there waiting at the studio, and she just killed it. She had really been practicing the song, and she came very, very professional." Small wonder Staples was happy to record with Galactic. The musicians are in demand as players, composers and producers. But Mercurio admits that words are not really their strong suit. "We don't truthfully have a strong lyrical writer in the band, and I think that's probably good that we have acknowledged that," he says with a laugh. "I don't think there's any shame to reach out and know your weaknesses, and try to achieve the best quality that you can." Charm Taylor of the Louisiana band The Honorable South stepped up to the plate. Galactic sent her the music, and the lyrics she came up with blew them away. Taylor turned the song "Right On" into a kind of tribute to a Galactic concert. She even scolds someone for talking: "You keep talkin' and talkin' and I just wanna dance," she sings. Mercurio says she told the band she was "envisioning being on stage performing the song," which plays almost like a call and response between Taylor and the musicians. The result is an irresistible, pulsating tune that would make even the stiffest board move. "We were definitely high-fiving each other in the control room," Mercurio says. Other collaborations require a little more back and forth. A few different people wrote the album's title track, "Into The Deep," a soulful, reflective tune sung by Macy Gray. San Francisco musician Jim Greer, who has been friends with Galactic for years, used the song to express deep, personal loss. "His child had passed a couple of years before from a brain illness," Mercurio says, "so he kind of brought lyrically into that." Another musician friend, New Orleans songwriter David Shaw, guided the song into a more R&B vein. Then they sent a demo to Macy Gray, who came up with some lines. "They only liked a little bit of my ideas," Gray says matter-of-factly. After all of the rewriting, Gray says, the recording itself was a breeze. "It came together real naturally. It just kind of woke up and it was there already," she says. "When I rehearse my band, we rehearse all day, like eight hours, and come back and do eight more hours." Galactic, she says, has streamlined the process: "Two hours and they're out. Galactic's been together forever. They don't need to rehearse." Working with lots of different artists gives the musicians in Galactic the chance to stretch. At the same time, the new album has at least one instrumental track that is all New Orleans. The song "Sugar Doosie" is named for a well-known second line dancer — those who dance in New Orleans parades after the main line. Ben Ellman says he imagined this song being played in a parade by the famed Rebirth Brass Band. "When the song is hot, you see people dancing on cars, slapping stop signs and generally getting possessed with dance and excitement," Ellman says. "And that was the idea — you know, let's write a song and maybe we'll see the Rebirth playing it down the street one day." After 20 years, the musicians in Galactic have carved out the perfect career for themselves: They get to play with others but also take charge of the game. 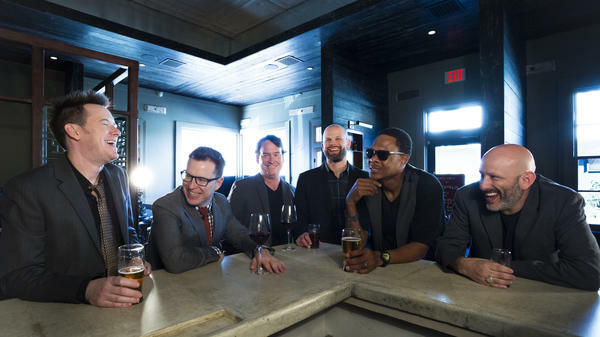 For 20 years, the New Orleans band Galactic has been making people dance. MARTIN: To celebrate its 20th birthday, Galactic is on tour. And they've released a new album. It's called "Into The Deep," and it features a number of guest vocalists, including Mavis Staples and Macy Gray. Even so, NPR's Elizabeth Blair says the group defines itself this way. ELIZABETH BLAIR, BYLINE: First and foremost, Galactic is an instrumental group. A first-rate funk band is how The New York Times describes it. The five New Orleans-based musicians do just fine on their own without a regular vocalist. But they really like the process of working with different singers, says sax player Ben Ellman. BEN ELLMAN: You know, we're big fans of, like, The Meters and Booker T. and the MG's and these bands that have worked as sort of the backing band for various vocalists. And that has kind of been our model. BLAIR: A model one of the singers on Galactic's new album knows well. GALACTIC: (Singing) Does it really make a difference if we don't see eye to eye? BLAIR: When Mavis Staples agreed to appear on the album, it was like a dream come true for the musicians in Galactic. ELLMAN: Yeah, we're really lucky. ROBERT MERCURIO: We were really lucky. BLAIR: Bass player Robert Mercurio says they couldn't believe she said yes. MERCURIO: Down to the moment when Ben and I were flying up to Chicago to record with her, we were like, I hope she shows up (laughter). You know, and she was there waiting at the studio. And she just killed it. She had really been practicing the song and she came very, very professional. GALACTIC: (Singing) Does it really make a difference at all? Are we gonna let the big things take over the small? Does it make a difference at all? Oh, does it make a different at all? BLAIR: Small wonder, Mavis Staples was happy to record with Galactic. The musicians are in demand as players, composers and producers. But Mercurio admits that words are not really their strong suit. MERCURIO: We don't truthfully have, like, a strong lyrical writer in the band. And I think that's probably good that we have acknowledged that (laughter) 'cause I don't think there's any shame to reach out and know your weaknesses and try to, you know, achieve the best quality that you can. BLAIR: Another singer they really wanted to work with on the new album was Charm Taylor of the Louisiana band The Honorable South. They sent her the music. And the lyrics she came up with blew them away. She turned the song into a kind of tribute to the band's live concerts. She even scolds someone for talking. GALACTIC: (Singing) Oh, you keep talking, talking, and I just wanna dance. I just wanna dance. MERCURIO: She said that she was envisioning being on stage performing the song and that, you know, she would go, and the drums go. And the drums would go, and the horns would go. MERCURIO: And she thought, you know, it would be a great live kind of experience to command in that way. GALACTIC: (Singing) Waiting there. Are you still waiting there? Waiting there, waiting there. Why are you still waiting there? MERCURIO: We were, like, definitely high-fiving each other in the control room (laughter). BLAIR: Other collaborations require a little more back and forth. Take the title track from the album "Into The Deep," sung by Macy Gray. GALACTIC: (Singing) Hopscotch, Double Dutch, going fishing. It don't matter if you're playing or wishing. Feeling like we're too far gone. BLAIR: A few different people wrote this song, beginning with San Francisco musician Jim Greer, who's been friends with Galactic for years. Robert Mercurio says he used the song to express deep, personal loss. MERCURIO: His child had passed a couple of years before from a brain illness, and so he kind of brought lyrically into that. BLAIR: Another musician friend, New Orleans songwriter David Shaw, got involved. MERCURIO: I think he was kind of thinking in a more of a - like a soul, R&B vein. BLAIR: Then they sent it to Macy Gray, who came up with some lines. MACY GRAY: And then they only liked a little bit of my ideas. BLAIR: But no hard feelings, says Gray. After all of the rewriting, she says the recording itself was a breeze. GRAY: Came together real naturally like, you know, it just kind of woke up, and it was there already. We had one rehearsal. No, we had two. We had two rehearsals. But they rehearsed like - you know, when I rehearse with my band, we rehearse all day, like, eight hours, come back, eight more hours. They do, like, two hours and they're out. So Galactic's been together forever. They really don't have to rehearse. GALACTIC: (Singing) Into the deep we go. I can't tell you how to live your life it's just not what I know. You're the keys to all my judges open up the door. Into the deep we go. BLAIR: Working with lots of different artists gives the musicians in Galactic the chance to stretch, say Ben Ellman and Robert Mercurio. At the same time, their new album has at least one instrumental track that's well within their New Orleans comfort zone. BLAIR: "Sugar Doosie" is named for a well-known second line dancer. In New Orleans, second-liners dance in parades after the main line. Ben Ellman says he imagined this song being played by the famed Rebirth Brass Band in a New Orleans street parade. ELLMAN: When the song is hot, you see people dancing on cars, slapping stop signs and, like, you know, getting generally possessed with dance and excitement. And, you know, that was sort of the idea of, like, let's write a song and, you know, maybe we'll hear the Rebirth playing it down the street one day. BLAIR: After 20 years, the musicians in Galactic have carved out the perfect career for themselves. They get to play with others but also take charge of the game. Elizabeth Blair, NPR News. MARTIN: This is WEEKEND EDITION from NPR News, I'm Rachel Martin. Transcript provided by NPR, Copyright NPR.